Who has these? Do they work as well as everybody says they do? Whats the verdict on these? Shes in need of some new eyes. 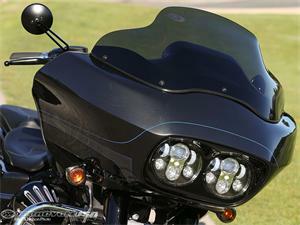 The Harley Daymaker lights are incredible. On a ride through Montana and Wyoming to Sturgis at 3AM, 2 of us with these lights had to lead the rest of the pack to highlight all of the deer on the highway. They are expensive but a nice upgrade.